Shopping locally is a great way to support the local economy and allows you to grab a great deal this Black Friday! The Brecon Beacons is one of the best places to do this, with so many independent shopping streets and quirky gifts you will love! The Beacons Farm Shop at the Welsh Venison Centre sells bread, eggs, bacon, beer and wine with their gift shop stocking beautiful, hand-picked gifts for your home or friends. There are lots of children’s presents including baking and gardening sets, wooden toys and colourful lunch bags. Bread Kits from Talgarth Mill. If you know someone who likes nothing better than sipping away at a scotch or gin at the end of the day, forget the big names and watch them marvel at the taste of one of Penderyn award wining welsh whisky’s or gin’s. Or why not book a tour of the distillery, something to look forward to in the New Year find out more here. In the Brecon Beacons we are proud to have two vineyard’s Sugar Loaf Vineyard, and White Castle Vineyard. What better way to celebrate Christmas than by giving a bottle or two of Welsh Wine! Find out more here. For the Cheese lover. Blaenafon Cheese are a specialist cheddar cheese company based in the World Heritage site of Blaenafon, South Wales. The produce fifteen very distinctive cheddars and four varieties of goat’s cheese. All the cheeses are hand made at our shop in Broad Street Blaenafon. Go online to buy. 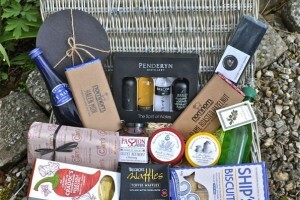 Authenically Welsh provide a wonderful range of hand packed hampers bursting with flavoursome Welsh foods … delivered directly to your doorstep – perfect for a really Welsh gift this Christmas. Have a look at all the hampers and order yours online. With one of Wales’ best known brewers Buster Grant at the helm, Brecon Brewing have created a range of beers full of flavour and character inspired by the dramatic Brecon Beacons. Producing quality real ales, cask beers, bottled and canned beers in Wales – available in the brewery shops now, and online shortly.